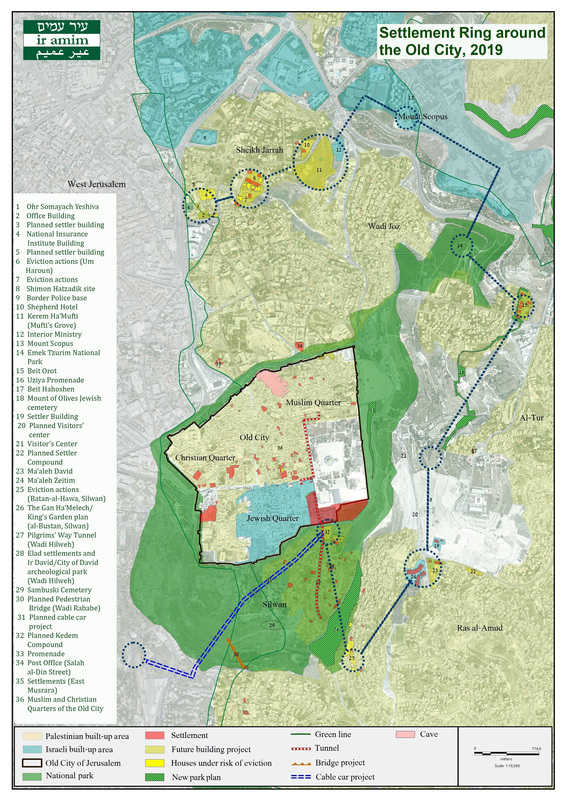 Ir Amim’s latest map, “Settlement Ring around the Old City, 2019,” graphically illustrates the accelerated, intensifying chain of new facts on the ground in the most historically contested and politically sensitive part of Jerusalem: the Old City and adjacent ring of Palestinian neighborhoods. In addition to a mounting number of state-sponsored settlement campaigns inside Palestinian neighborhoods – settler initiated evictions of Palestinians, takeovers of their homes, and the expansion of settler compounds – touristic settlement sites function as key points along a ring of tightening Israeli control. The population density in the built-up areas of the Old City limits Israel’s ability to advance plans for residential settlements as a means of altering its demographic character. After more than 50 years of Israeli control over East Jerusalem, nearly 100,000 Palestinians live in the Old City and the surrounding neighborhoods and at most 6,000 Israelis, 3,000 of whom live in the Jewish Quarter of the Old City. In grappling with this demographic reality and with the symbolic value of a space holy to three religions, non-residential projects – especially those targeting tourism and archeology – assume a central role in Israeli settlement policy. The privatization of project management to nationalist settler organizations enables the Israeli government to exploit tourism as a tool for reinforcing settlement initiatives in the Old City and its environs, erasing the significant Palestinian presence there, promulgating the idea of the entire area as an Israeli environment, and imposing a nationalistic Israeli character that blurs the multi-religious and multi-cultural nature of the space, primarily to the detriment of the Muslim sites and presence. Ultimately, this use of national parks and tourist sites serves the goal of transforming the Palestinian neighborhoods in and around the Old City – including Silwan, A-Tur, Ras al-Amud and Sheikh Jarrah – from a densely populated Palestinian area into one sprawling tourist site that bolsters Israeli control of the area and access to it. They connect otherwise isolated and relatively small settlement compounds inside Palestinian neighborhoods, creating a contiguous ring of settler controlled areas. They fracture the Palestinian space, disrupting freedom of movement and breaking large neighborhoods into smaller, easier to police enclaves. While the number of ideologically driven settlers living inside Palestinian neighborhoods may still be relatively small, tens of thousands of nonideological Israeli tourists visiting these sites serves to strengthen the Jewish presence inside Palestinian areas of the city. LINK HERE TO DOWNLOAD MAP. LINK HERE FOR ACCOMPANYING MAP NOTES. The temporary freeze on the Sabbagh family eviction in Sheikh Jarrah could be lifted at any time and immediate intervention is needed to block the displacement of this 40-member family from Sheikh Jarrah. The Nahalat Shimon Company (spearheading the eviction in behalf of settlers) has now submitted its response to an appeal to the Execution Office submitted by the family’s attorney, increasing the probability that the eviction will proceed swiftly. The 40-member Sabbagh family recently lost a Supreme Court petition to introduce new Ottoman era documents challenging the original Jewish ownership rights on which settlers have waged a campaign to take over the entire Kerem Alja’oni section of Sheikh Jarrah. If evicted, their home will be the tenth in the area to be seized by settlers. Roughly thirty Palestinian families are under threat of eviction and at least eleven have open court cases. Those cases were suspended pending the Supreme Court decision; the recent removal of that stopgap could usher in a wave of new evictions. Today Ir Amim learned that the Ohr Somayach yeshiva (sometimes referred to as the “Glassman Yeshiva”) is on the agenda for the February 17 session of the District Planning and Building Committee. This plan should be seen as an alarm bell in the context of Israel’s policy in the Old City Basin. The plan for the yeshiva (Plan No. 68858) calls for construction of an eleven-story building with eight levels above ground and three below, including a dormitory for hundreds of students and housing for faculty, to be located at the mouth of Sheikh Jarrah. The plan was submitted by the Ohr Somayach Institutions, to which the Israel Land Authority has already allotted land without a transparent tender process, and approved for deposit by the District Planning and Building Committee in July 2017. As the plan was never deposited for objections, it is unclear how the District Committee intends to treat the plan on February 17. On February 5: The Local Planning and Building Committee discussed objections to two plans being promoted by city councilperson and settler leader Arieh King in the Um Haroun section of Sheikh Jarrah. The Committee did not apprise objectors of the discussion and convened it without their participation. Construction of the two buildings – one for 10 units and the other for 3 – would require the tear-down of buildings where 5 Palestinian families are currently living. These are two of the plans that were unfrozen in the surge of 2,000+ plans promoted in the summer of 2017, which also saw the Shemasneh family eviction. In Um Haroun, 45 Palestinian families are under threat of eviction. There are at least nine families with eviction cases pending in court and an additional five that have received warning letters attached to eviction claims. Two families have already been displaced and their homes taken over by settlers. Arieh King has promised to put 400 new families in Sheikh Jarrah in the next 10 years. On February 3, Ir Amim reported on several new eviction proceedings in the Muslim Quarter of the Old City, including the imminent eviction of the Abu Asab family and the renewal of proceedings against the Ghaith-Sub Laban family, and will be reporting on new cases being brought against the Basha family in the Muslim Quarter and the Haji family in Um Haroun. On January 27, the plan for the controversial cable car project was deposited for objections in the National Infrastructures Committee in an expedited process that obviates the need for the regular planning committees and minimizes the possibility of effective public opposition. Represented by authorities as a public transportation project to facilitate access to the Western Wall and the Old City, the cable car will actually function as a key link in the expanding Israeli ring around the Old City – in this case, creating contiguity with West Jerusalem, its point of origin. It is expected to channel thousands of people a day to the edge of the Old City, alighting on the roof of the Elad settler organization’s future headquarters, the Kedem Visitors’ Center, and connecting them to a constellation of touristic settlement sites. It is safe to assume that many will be unaware of crossing the Green Line into illegally annexed East Jerusalem and traveling over the heads of Palestinian residents at risk of displacement. On January 24, a plan for a new visitors’ center on the Mount of Olives was deposited for objections. While the plan is under the purview of the Municipality and Jerusalem Development Authority, the Municipality’s hiring of architect Arie Rahamivov, Elad’s internal planner, indicates settlers’ likely involvement in the project. Elad operates another visitor center on the Mount of Olives in close proximity, one of a growing number of tourist sites in the Old City Basin under its management. The elements of the Sabbagh family case are reflected symmetrically on the southern side of the Old City in Batan al-Hawa, Silwan, where settlers are exploiting the same law to wage the most comprehensive settler takeover campaign since the annexation of East Jerusalem in 1967. The Legal and Administrative Matters Law of 1970 enables Jews to reclaim assets lost during the war of 1948 via the Israel General Custodian. Palestinians have no parallel legal protections; moreover, the 1950 Absentee Property Law enshrines that Palestinians who lost their assets in Israel in 1948 cannot recover them. Based on their cooptation of a Jewish trust that held title to properties in Batan al-Hawa, the Ateret Cohanim settler organization has acquired two plots of land from the Israeli General Custodian, from which it is waging a campaign to evict an entire community of some 100 Palestinian families (600 – 700 people). Seventeen families have already been displaced. The private settlement compounds being built in the Old City and around its circumference (where roughly 2,500 settlers are now quartered) cannot be quantitatively compared to settlement building in the ring neighborhoods of East Jerusalem but qualitatively, they have disastrous implications for Palestinians in Jerusalem, the relationship between Palestinians and Israelis in city, the two state solution, and the Old City as home and historic center of the three major monotheistic world religions. It is vital that the traditional calculus of settlement building be readjusted to 1) treat these coordinated efforts to consolidate control of the Old City and surrounding Palestinian neighborhoods with the same urgency afforded to settlement building throughout the whole of East Jerusalem; 2) ensure a holistic response that regards private settlement inside the Old City Basin and touristic settlement not as individual phenomena but as multiple elements of a unified and politically lethal strategy to unilaterally entrench Israeli control and undermine an agreed political resolution on the city. This escalation of new facts on the ground in lead-up to the anticipated unveiling of a US peace initiative only further erodes opening conditions for any future plan – the viability of which, among other conditions, will be contingent on the principle that alongside West Jerusalem as the capital of Israel, East Jerusalem must serve as the capital of the future Palestinian state – as an organic territorial, demographic, and communal entity connected to the Old City Basin. Correction: A February 3 alert referred to “the Kerem Alja’oni section of Silwan.” Kerem Alja’oni is in the neighborhood of Sheikh Jarrah.